If you’ve ever wished for a secret weapon — something that helps steer quality candidates to the pipeline and away from the competition—here it is. 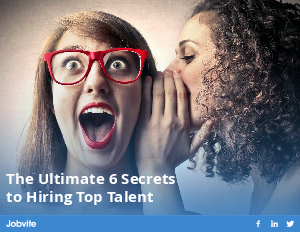 Jobvite's latest eBook, “The Ultimate 6 Secrets to Hiring Top Talent,” shows you how to make the most of your available resources and fill the funnel fast. Learn how to ramp up your recruiting data, compete and successfully hire passive candidates, and build better, stronger relationships with your hiring managers.